This dish is very close to one of my most favorite dishes ever- the Parmesan Crusted Baked Fish from Cookbook Kitchen (they have 3 branches now- 1 in Mandaluyong, 1 in Eastwood and 1 in Pampanga). And making something similar proved to be a bit of a challenge at first. It wasn't the taste, or the texture that I couldn't perfect at first. It was that- my baked fish came out watery every time. And then, I tried this trick that allowed me to make the most perfect baked fish every single time! Sear till it changes color, but not quite cooked. Transfer to bakeware, smother with the dressing and topping. Scatter cherry tomatoes and pop in the oven. 1. 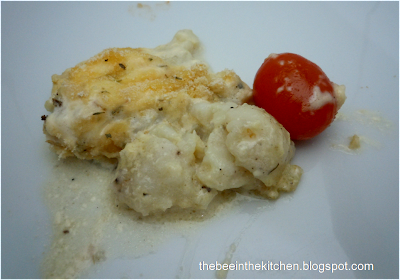 Wash the fillets, season lightly with salt and pepper and rub a very thin layer of flour. Do not cover the whole thing with flour. (roughly 1 T per fillet). 4. In a small bowl, combine mustard and mayonnaise. Use this to completely cover the fillets. 5. In a separate dry bowl, combine breadcrumbs, cheese, and herbs. Dust over the fillets. 6. Top with cherry tomatoes. 8. Serve with rice or potatoes.